We are ahead our competitors in industry for manufacturing and exporting high quality Hand Knotted Floor Carpets. 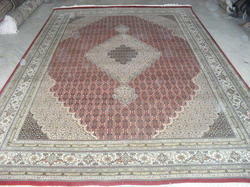 Our wide collection of thee carpets can be availed in different designs, color combinations and unique patterns. Owing to their unmatched quality and elegant patterns, these carpets are widely used to enhance the beauty of the interior. Our range is demanded in various schools, colleges, offices and many other organizations. 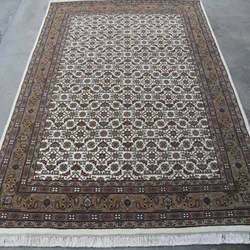 We are one of the recognized manufacturers and exporters of a wide range of Hand Knotted Carpets that can be availed in various weights, sizes, designs, colors and patterns as per the clients’ specific requirements. We have designed and developed our exclusive range in accordance with the industry standards. Apart from this, we offer our range after passing them on different quality parameters to ensure their faultlessness. With state-of-the-art facilities, we are engaged in manufacturing and exporting an extensive range of Hand Knotted Woolen Carpets. With the help of our skilled and experienced staff members, w are able to offer our best quality carpets in short duration of time. We offer our range with the meticulously designed motifs in attractive deigns and in unique patterns that meet individual requirements of the clients sufficiently. 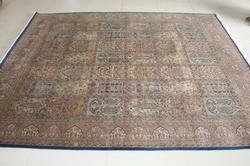 Our range is known for their persian art, perfect finishing, reliability and less maintenance. We have gained vast industry experience in the field of manufacturing and exporting an extensive range of Silk Hand Knotted Carpets. 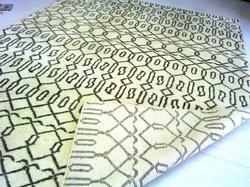 We have made the use of best quality materials and sophisticated technologies in manufacturing these carpets. Their smooth finishing, durability, reliability, and elegant designs and many other outstanding features make them widely appreciated and demanded all over the world.